Pat Lynch, the president of the NYPD’s PBA speaks out on the difficulties officers face when they’ve been badly injured. 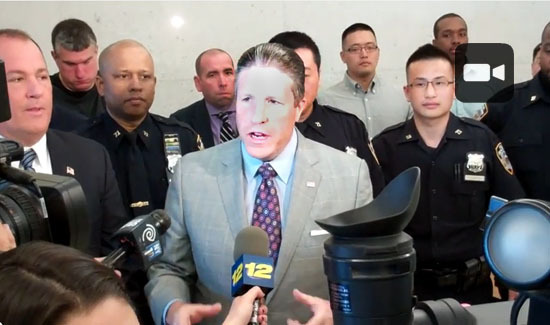 In New York City, a contingent of officers from the 71 Precinct joined PBA President Pat Lynch and PBA board members at Brooklyn Supreme Court to bolster support for the prosecution of Rashaun Robinson who shot NYPD Officer James Li three times to avoid a fare-beat arrest that would have revealed his illegal gun. 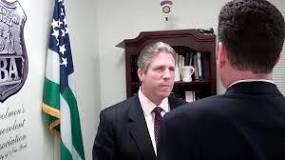 Following the court hearing, Pat Lynch spoke to reporters and talked about Officer Rosa Rodriguez’s release that day from the hospital and the difficulty police officers face in returning from a serious line of duty injury. Rodriguez, 36, and a mother of four, had been hospitalized since April 6 when she and Officer Dennis Guerra responded to a fire on the 13th floor of a building Brooklyn. They took an elevator to the floor but were immediately overcome by smoke and toxic fumes from the fire. Officer Guerra, 38, died April 9 after sustaining lung damage. Rodriguez suffered the same injuries as Guerra and doctors believed there was a 50 percent chance she would die. But as time went on and her lungs healed with the help of a breathing machine and medication, it became clear she’d survive. Grants for vests at risk, will states step up?